The Panda USB Vaccine allows users to vaccinate their PCs in order to disable AutoRun completely so that no program from any USB/CD/DVD drive (regardless of whether they have been previously vaccinated or not) can auto-execute. 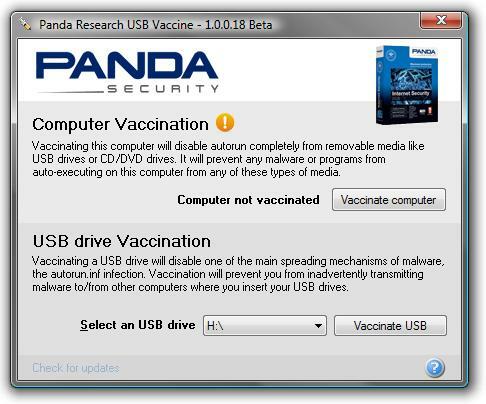 The Panda USB Vaccine also can be used on individual USB drives to disable its AUTORUN.INF file in order to prevent malware infections from spreading automatically. When applied on a USB drive, the vaccine permanently blocks the AUTORUN.INF file, preventing it from being read, created, deleted or modified. Once applied it effectively disables Windows from automatically executing any malicious file that might be stored in that particular USB drive. The drive can otherwise be used normally and files (even malware) copied to/from it, but they will be prevented from opening automatically. Please take into account that vaccinating a USB drive is a non reversible operation and under some very unlikely conditions some applications could stop working. In any case if you do not have an AUTORUN.INF file in your USB drive it’s completely safe to vaccinate it.